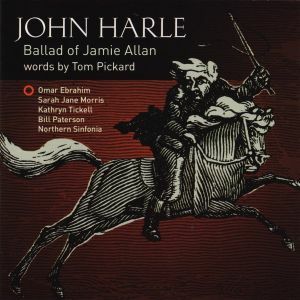 The Ballad tells the story of Jamie Allan, an eighteenth century Northumbrian, piper to the Duke of Northumberland, and a wanted criminal. Allan had a double life. On the one hand he was a magical musician, playing for royalty. On the other hand he was a horse thief who deserted from the army five times. He died in Durham Jail, aged 75, having been pardoned from a death sentence by the king. The music is composed by John Harle and the libretto is written by Northumbrian poet, Tom Pickard. Jamie Allan was commissioned by The Sage, Gateshead for their opening season in 2005.